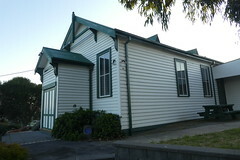 Wandong Public Hall (formerly Wandong Mechanics' Institute & Free Library) Opened on 17 October 1902. The Mechanics' Institute movement began in British urban industrial centres in the early 1800s. A "mechanic" was a person applying skills and technology. During the 19th century, most towns in Victoria established a Mechanics' Institute or Athenaeum with a library and meeting hall. Common objects were the "spread of useful knowledge" and provision for "rational recreation" in the community. The hall was built as the growing population needed a larger meeting place. A donation of timber from the Australian Seasoned Timber Company, and fundraising activities around the district, helped build the hall. 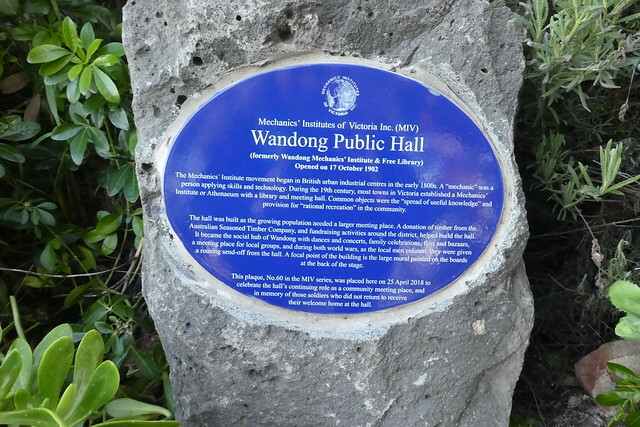 It became the social hub of Wandong with dances and concerts, family celebration, fairs, and bazaars, a meeting place for the local groups, and during both world wars, as the local men enlisted, they were given rousing send-off from the hall. A focal point of the building is the large mural painted on the boards at the back of the stage. This plaque, No. 60 in the MIV series, was placed here on 25th April 2018 to celebrate the hall's continuing role as a community meeting place, and in memory of those soldiers who did not return to receive their welcome home at the hall.